Goal – The overarching goal of research in this topic area is to use sound as a tool for managing interactions between human activities and marine life. For this project, we conducted a series of experiments on the responses of marine mammals to net alarms (“pingers”) and simulated fishing gear in order to understand how they might become entangled and why pingers seem to reduce interactions. Importance – Acoustic instruments such as pingers can be used to reduce injury and mortality in fishing gear. However, there has been little detailed research on the precise behaviors of marine mammals as they interact with gear and instruments. Originally, we were asked to help NOAA managers understand what happens during such interactions, working with the diverse collection of cetaceans and pinnipeds at SeaWorld. 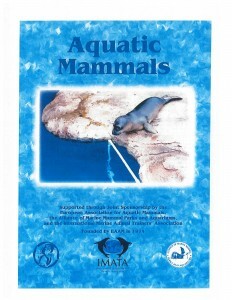 Similar studies on manatees were funded by the U.S. Fish and Wildlife Service. All of the work is important to effective prevention of entanglement and also will help improve instruments designed to prevent harmful interactions in the future. Additional work is needed to address continuing issues associated with entanglement in marine debris and fishing gear. Background–Sound can be a powerful tool for solving many kinds of problems, such as reducing collisions with vessels and excluding marine mammals from dangerous areas. However, the applications are not simple. Different species – or even individuals – react differently to sound depending on its characteristics, the context, and their life experience. Methods and Results – We documented marine mammal interactions with simulated fishing gear and pingers in collaboration with SeaWorld. We exposed the subjects experimentally to gear with and without pingers, including three species of cetaceans and three species of pinnipeds. We discovered that these species generally found net alarms to be mildly aversive (Bowles and Anderson 2012) but we don’t yet know whether this is true of the manatee. However, mild aversion didn’t consistently prevent interactions, even when individuals had previous experience of contact with the simulated net. Sometimes animals startled into the net; sometimes they rushed into it, apparently believing they could just break through; and sometimes they directed aggressive gestures at it, as if it represented a challenge. Why Does the Research Matter? Experimental research on interactions between marine mammals and fishing gear is needed to show whether proposed management strategies or new technologies will be useful for given applications. Efforts to prevent manatee interactions with crab pots represent the best opportunity for the near future because we have good potential solutions based on our feasibility research in the lab. Donors could make it possible to test the proposed gear in Florida, collaborating with the HSWRI Florida stranding team, its interns and volunteers. We are also interested in testing technologies developed in Europe and Australia for preventing fisheries interactions and entanglements or ingestion of marine debris. Bowles, A.E., S.L. Denes, and M. Shane. 2010. Acoustic characteristics of ultrasonic coded transmitters for fishery applications: could marine mammals hear them? Journal of the Acoustical Society of America 128(5): 3223-3231. Jaffe, J., F. Simonet, P.L. Roberts, and A.E. Bowles. 2007. Measurement of the acoustic reflectivity of Sirenia (Florida manatees) at 171 kHz. Journal of the Acoustical Society of America. 121(1):158-165. Thomas, J.A., S.R. Fisher, L.M. Ferm and R.S. Holt. 1986. Acoustic detection of cetaceans using a towed array of hydrophones. Pages 139-148 in G. P. Donovan, ed. Reports of the International Whaling Commission (Special Issue 8). Behavior of Whales in Relation to Management. International Whaling Commission, Cambridge.